Following on the same path as American Airlines and other commercial airlines, the United States Air Force will possibly get rid of all of the paper and charts in their cargo planes by implementing iPads for the aircrafts. 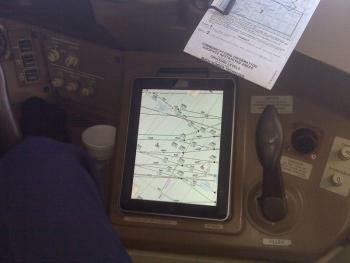 All of the papers, charts, and pilot manuals weigh hundreds of pounds, but with the help of an iPad, all of those papers will be unnecessary. The special iPads will have the manuals and everything else needed preloaded digitally onto the device. According to Tab Times, the Air Force hopes to buy a minimum of 63 and a maximum of 18,000 iPad 2 devices. The Air Force’s Air Mobility Command’s (AMC) planned purchase could be the largest single federal order for a tablet, according to the site NextGov, which reported on the deal after seeing a notice at the Federal Business Opportunities website. The notice said AMC wants to buy “a minimum of 63 and a maximum of 18,000, iPad 2, Brand Name or Equal devices” for cargo aircraft such as the C-5 Galaxy and C-17 Globemaster. This request by the Air Force states that they are looking for “iPad 2, Brand Name, or Equal devices”, but they will most likely choose the iPad 2. If the deal goes through, this will be the biggest tablet order ever by the federal government.